Prachuap Khiri Khan is ideal if you want some beach, some mountains, to rent a bike, drink some beers and hang out in a low-key town. 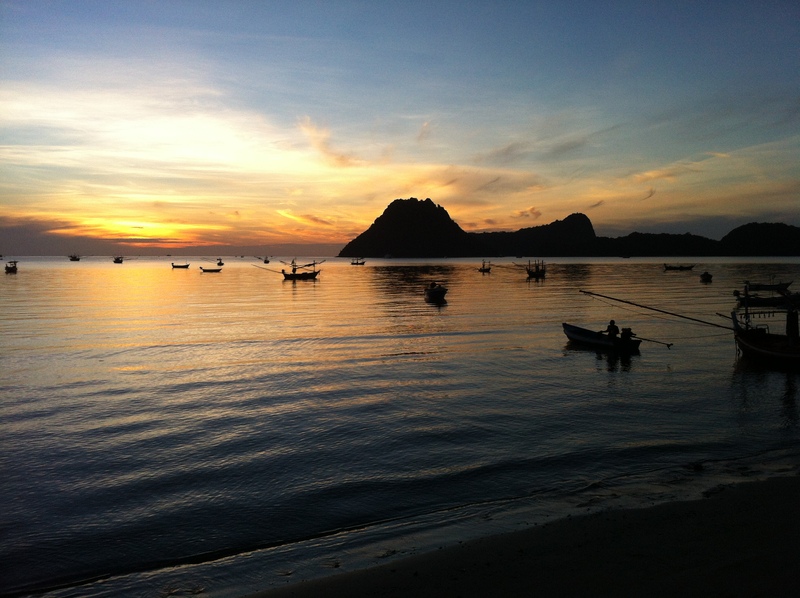 If you’re looking for 5-star hotels, over priced seafood, full moon parties, joy rides in tuk tuks and numerous beach combining venders trying to sell you, well, anything, then Prachuap isn’t for you. I took the train, it’s five hours from Bangkok, five hours still qualifies as a quick trip when I have no responsibilities other than replying to emails like I’m still in the office. Part of the reason a trip to Prachuap Khiri Khan is nice is you can take the morning express train from Bangkok and be in Prachuap by 1pm. The cost of a round trip ticket on the train was around thb950, you can book in advance. Prachuap Khiri Khan is a smallish town located on a bay, there isn’t great beachfront in the town, the Ao Manao beach is just 15 minutes away by bicycle. The town has a long boardwalk (or strand) along the water and a pier, the bay itself is filled with small fishing boats and the water calm. If you arrive via train, there are motocye taxis that take you from the train station to your hotel. Mountains make the views spectacular, the mountains dive straight into the water. Pull up a chair at Ao Manao beach, have a beer, stare the water and mountains, take a nap. Bike rental was available at a number of shops along the boardwalk in Prachuap- thb50 per day with no ID or deposit required. 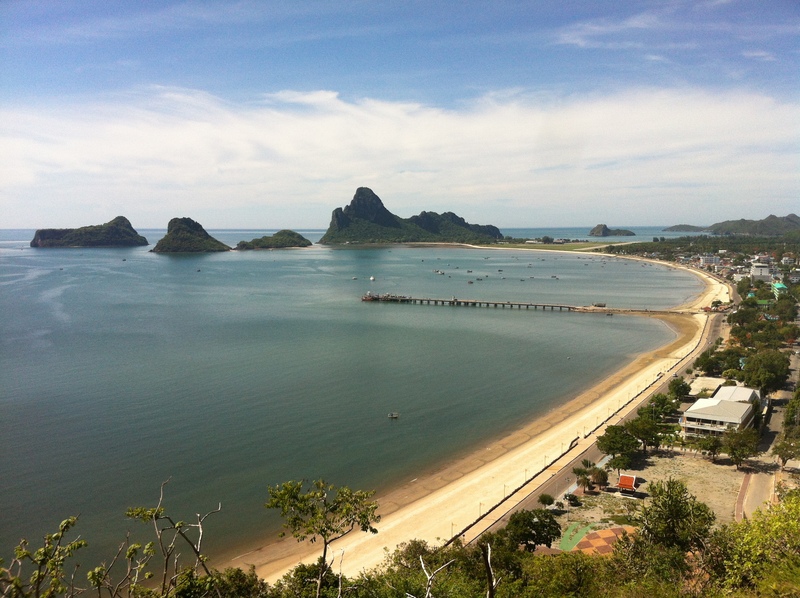 You can easily cycle to Ao Manao and all through Prachuap. Food is good and local, that is always a big draw for me. Restaurants along the main street in Prachaup are all outdoor, most displaying the fresh catch and various shellfish- you pick you fish and tell them how you want it cooked. Prices are very affordable. Activity- Ao Manao is the beach to hang out during the day, you can rent a sea kayak there, go swimming (water is calm, warm and shallow) or just walk around on the beach. There are loads of umbrellas and chairs with food, beer and beverage service. If you’re up for a good hike, try going up Khao Lommuak mountain. It’s the big mountain you see from Ao Manao, the hike is strenuous with stairs at the beginning and ropes toward the top. The view from the top is well worth the hike, go in the morning when it is cool, or at least not blazing hot. Prachuap has a good night market, just head to the pier (located right in the middle of town, middle of the boardwalk) and you’ll see it. There was a load of good food- from grilled pork to fresh prawns. I was underwhelmed by the hilltop temple in Prachuap due to the monkeys. 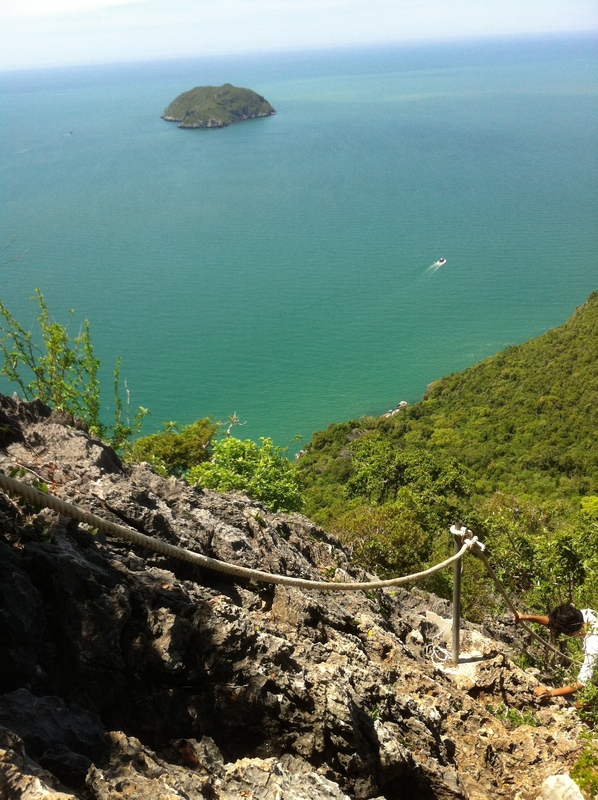 The views are very good, but paled when compared to the hike, view and tranquility of Khao Lommuak. The hilltop temple is called Chong Khra Chok, it’s about a 10 minute walk up stairs to reach the top levels of the temple. If you are visiting, get ready for some aggressive monkeys approaching you as you make the walk, the monkeys were trying to grab anything in our hands. Nightlife? Dunno. When I went the 10pm military curfew was in effect. I didn’t see any fancy nightlife venues, most people seemed to head to the night market, grab some local food, have some beers and head on home. Perfect. I put a few additional pictures on my tumblr account, you can view them here. If you’re looking for a more ‘local’ beach and experience, visit Prachaup. 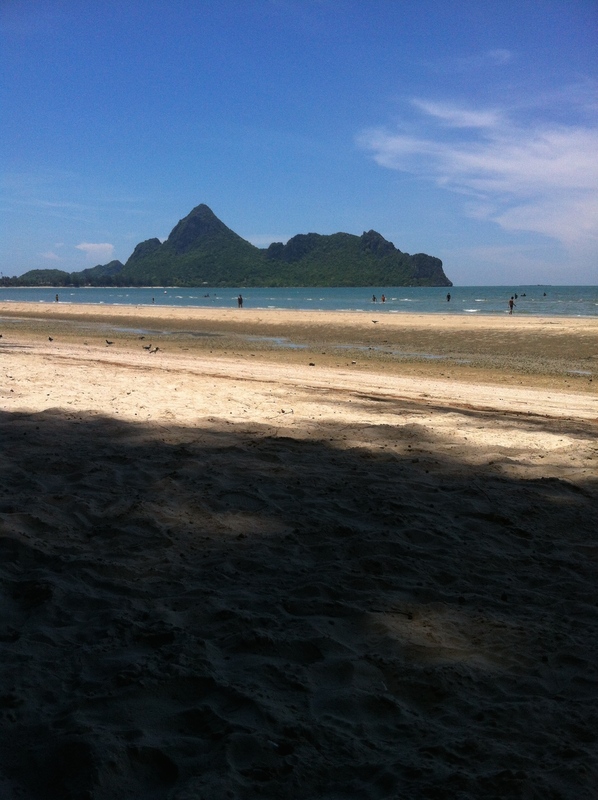 This entry was posted in Quick Trips From Bangkok and tagged Prachuap Khiri Khan, Prachuap Khirikhan, Thailand Beach. Bookmark the permalink. Great vantage points for these shots! Very nice… I’m headed to Thailand very soon. Essays like this one really make me look forward to it.